Back in 2008. Joe West produced The Ballad of Don Clavio, a strange but wondrous album by singer/ poet / visual artist and longtime La Cienega potter Bobby Brodsky. The album was a lo-fi affair consisting of music, sound collage, telephone messages, poetry, and insane rants. Brodsky died two years ago at the age of 60. 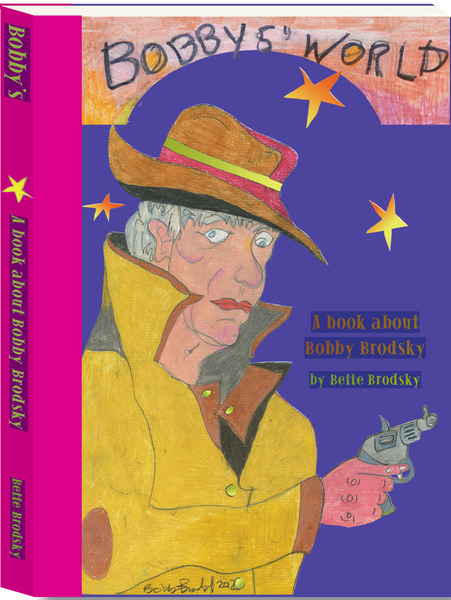 But his art lives on in a new book, Bobby’s World written and compiled by his sister Bette Brodsky. It features 100 color – vivid color! – reproductions of Bobby’s drawings, which are even more crazy than his music. He was like a manic version of Daniel Johnston, drawing strange pictures of animals, real and imagined (a dog with the body of a Cheshire cat appears in several), jungle critters, dragons, ducks, several naked girls, Wizard of Oz characters, critters that look like Sendak’s wild things, Santa Claus, cars, pyramids UFOs … Plus plenty of photos of Bobby and his family and his pottery; hand scrawled poems and lyrics from some of his favorite rock ‘n’ roll songs. Collectively they tell a wild of a soul amazed by life itself. Bette Brodsky will be signing copies of Bobby’s World 6 pm Tuesday Oct, 21 at the Collected Works Bookstore, 202 Galisteo St. Joe West will be playing music there, and he tells me they will be selling copies of The Ballad of Don Clavio as well. Read Paul Weideman's story about Bobby's World (and check out more Brodsky art) in today's Pasatiempo. And check my review of Joe West's Theater of Death songs on this here blog.